Great way to invest in gold bullion. Crystalline Gold Crystals on Quartz Specimen from the Frenchmans Adit at the Eagles Nest Mine in Placer County, California. It weighs 22 GRAMS (339 Grains)and is 1.3" long x 1.1" wide x 3/8" thick. Gold is 9 times heavier than quartz, so there is a lot of gold in this specimen. The quartz is a light gray color and one side of the specimen is covered with gorgeous and brilliant crystalline gold crystals. This is a very unique and beautiful gold crystals on quartz specimen. My Gold Crystal Specimens are second to none, all hand selected high quality gold specimens. Gold Crystals on Quartz specimens are becoming increasingly scarce and make great collectors items. 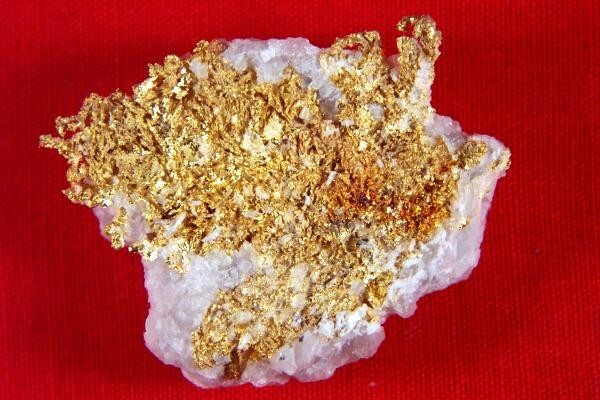 This is a beautiful example of natural crystalline gold crystals on it's host rock. A nice addition to any collection and a good investment as well.